1. I received a very early X’mas gift from Jay Nacino aka Prometheus Cometh two weeks ago and it was delivered through courier system. The gift was a compilation of running films/movies recorded in two (2) CDs. Thanks, Jay for the gift. God bless. 2. The following films were recorded in those two CDs: Chariots of Fire; Without Limits; 50/50; and Running The Sahara. Having seen the first two films mentioned in widescreen, I was very interested to watch 50/50 and Running The Sahara because they deal more on ultramarathon and multi-day stage runs. Both of these running events were filmed sometime in 2006. 3. I will not deal with the whole story of these films as every reader of this blog could easily browse or “google” the title of the films and they could get the details of these running events. 50/50 was made as a film and at the same time published as a book to document Dean Karnazes’ 50 marathon races, in 50 States in the US, in 50 days. Running The Sahara is a film about three (3) ultrarunners from the USA, Canada, and Taiwan traversing the African continent by passing through the Sahara Desert in 111 days. 4. What I like to point out and emphasize in these running events is the tremendous PLANNING involved to undertake such feats. 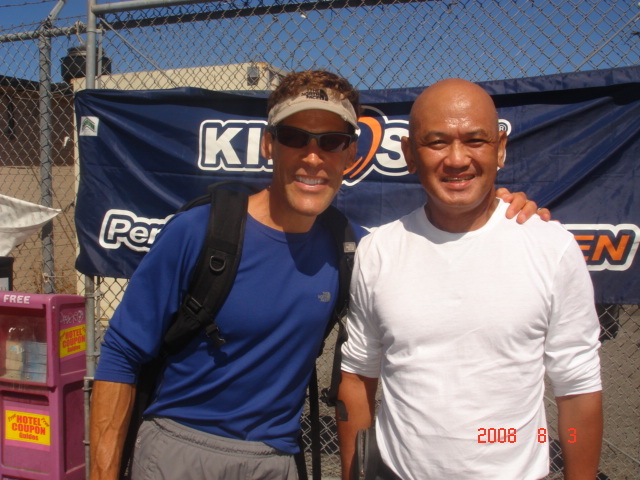 Dean Karnazes took at least 3 years to convince The North Face in appreciating his plan to run 50 marathons, in 50 different States, in 50 days and another year to finally coordinate and arrange for the implementation of the said project. It was only when his book “The Ultramarathon Man” became a No. 1 Top Seller and his being a top contender in the 100-Mile Western States and Winner in one of the Badwater Ultramarathon editions that he became popular. 5. The planning and preparation for the three (3) ultra runners in 3 different countries in the Running The Sahara took also years. Moreso, with the logistics; production/film crew; and other administrative requirements preparations for the event. This film/event also tested the endurance of the support staff and film crew in order to finish the running event. 6. These two running epic events were well-planned and documented. These films really inspire other people to seek their endurance limits and at the same time promoting some advocacies/charities to help less-fortunate people. So, if ever you plan to do such endurance run, whether an ultramarathon event or multi-stage/day run, you have to document it so that the INTEGRITY of the event is intact. A simple blog (with pictures) would do or inexpensive tracker/GPS device to record your event should be with you all the time during your run. I am selling two (2) copies of the book “Born To Run” in Hardbound for P 1,000.00 each. 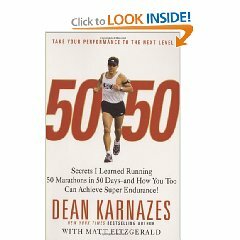 I have one (1) copy of Dean Karnazes’ latest book “50/50” for sale for P 850.00 (Hardbound). The proceeds will go to the training and support of the Elite Team Bald Runner Distance Project. First come, first serve! You can leave your comment if you are interested. 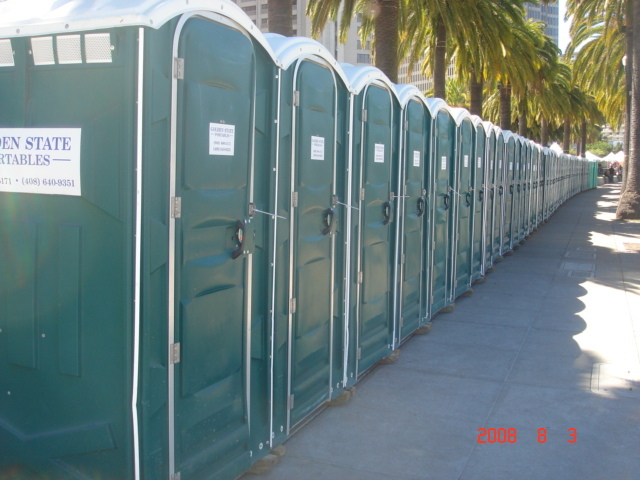 These were the portalets aligned at the vicinity of the Starting Line and more of these were positioned in almost all water/medical stations along the routes of the Full Marathon and 2 routes of Half-Marathon. 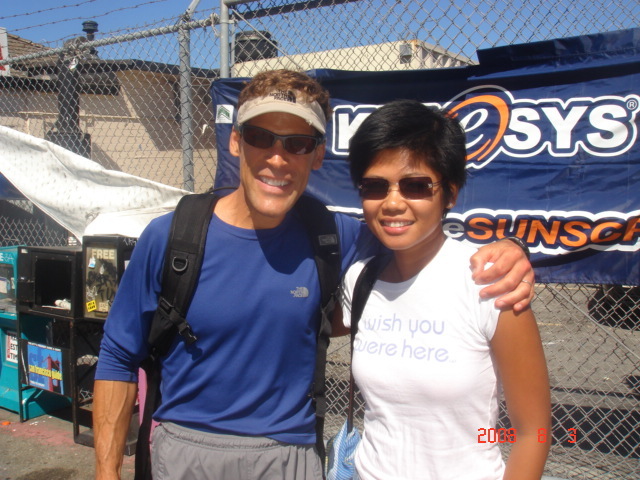 Dean Karnazes, the Ultra Marathon Man, with my daughter, Jovelle before we reached the Marathon Expo. Well, talking of coincidence? I have another photo-ops with the Dean K. He said to my daughter that I am crazy! Well, I think we are both crazy!!! 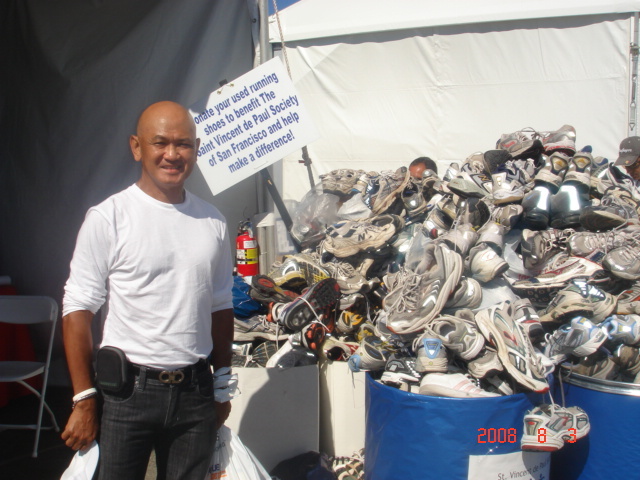 This is San Francisco Marathon’s version of their Project “Donate A Shoe”. Wow! The six (6) containers are 200-liter drums filled to the rim with donated used running shoes! 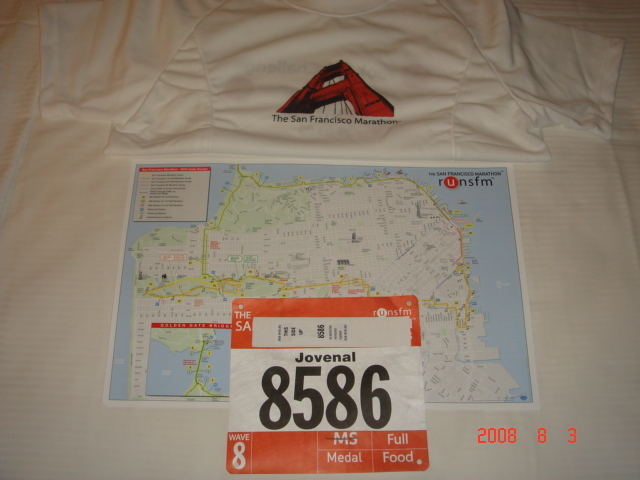 These are my race bib with my name printed in it and a strip (pasted above my name) of the ChronoTrack D-strip timing chip which is disposable; the map of San Francisco with the route of the course (yellow colored route) and a Finisher’s T-shirt. My recap of the race will posted later today. Bald Runner: Hi, Dean! I am a runner from the Philippines and they call me as The Bald Runner in my country. BR: I read your book and you instantly became my idol in ultramarathon and intend to join an ultra running event in the future. You are very popular to the runners in the Philippines. 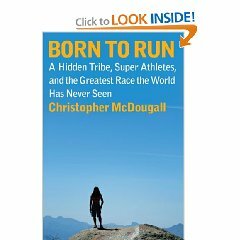 I have a blogsite and I posted your book and your accomplishments as the ultramarathon man. It’s baldrunner.com. DK: That’s great! I’ll check it out. BK: By the way, I will be running the San Francisco Marathon with my kids, son and daughter. DK: This coming San Francisco Marathon? DK: I will be at the Runner’s Expo for two days before the San Francisco Marathon and you have to see me there. I want to meet your kids! BR: Yes, we’ll meet you at the Expo. Can I have a picture with you, Dean? DK: You are welcome. I will check your blog. After that brief conversation, Dean left the place and went to his support vehicle to change his cap and get his hand-held water jug and later lined up with the rest of the runners at the starting line. After the runners left, my wife and I took some pictures at the Badwater Basin; checked and reviewed the pictures taken; drank a lot of water and Gatorade to replenish the sweat while I was taking pictures; and took some time to use the comfort room in the area. It was already almost 40 minutes had lapsed when I started to drive the car along the direction of the runners. Being sponsored by The North Face, Dean Karnazes wears running shoes and apparel of the said sports company. His running apparel is now lighter and different from his clothes when he ran the Badwater Ultramarathon in 2005.